Reaching for new batteries only to find that you’ve got everything but the right size is way frustrating. 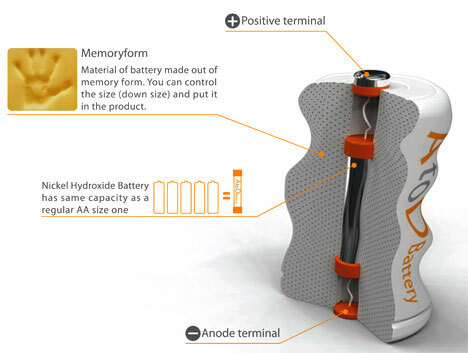 This unusual rechargeable battery concept lets you use one battery to power electronics that take any size batteries. Using this gadget, you could be powering your kids’ toys in no time without an inconvenient trip to the store. 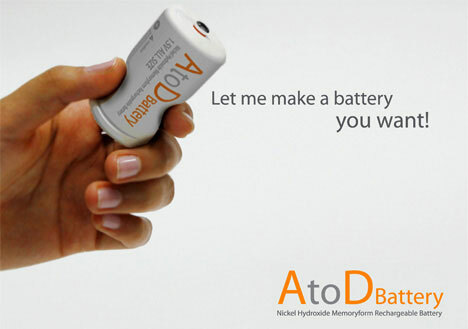 The A to D Rechargeable Battery works much like a standard battery, but with an outer coating of collapsible memory foam. When you need to power a gadget, you squeeze the battery until it’s the needed size. Then simply insert it into the gadget and it retains the correct size. The actual battery inside the foam is the same size as a standard AA battery. Given the small capacity of the battery, it’s hard to imagine that it would provide much life for any gizmo. 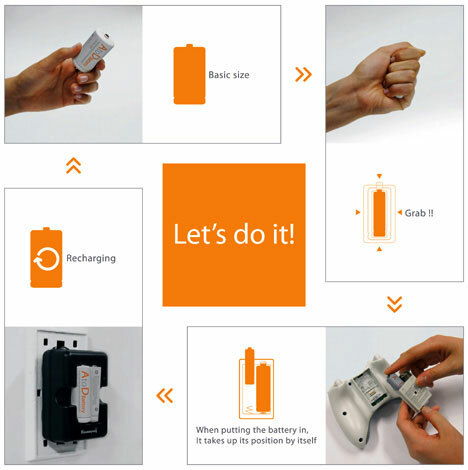 But when you really need something to work right now, being able to grab a one-size-fits-all battery would be the very definition of convenience. See more in Industrial Design or under Technology. May, 2010.